A blessed and joyous solemnity of Saints Peter and Paul to all our readers! As they were in life, comites, literally ‘fellow travellers’, so they were in death, leaving everything behind for the sake of Christ and His kingdom. The Saviour took two imperfect, and very different, men and fashioned them into His primary Apostles, pillars of the Church, whose glorious martyrdom crowned their saintly lives. Pursuant to the thoughts on Justice Anthony Kennedy yesterday, I highly recommend this analysis by Hadley Arkes in First Things which shows the limitations in the reasonings of the Supreme Court Justices, even the most conservative. I find it difficult to believe that Anton Scalia once admitted that if legislatures were to make abortion thoroughly legal, he would be obliged as a judge to enforce that law. I think Mr. Harkes is correct, that our current conservatives do not reason fully, nor soundly, enough, and trace not principles to their logical conclusions. At the heart of law is metaphysics, that whole philosophical view of life, its purpose, our final and proximate ends, the universe and creation. A materialistic Darwinist will make very different laws than a Christian steeped in the perennial teaching of the Church, which is why the Church has always taught that society must be ‘Catholic’. In the current legal context, that means laws based on the Judeo-Christian revelation, from the Ten Commandments onwards. A secular state will hold together for a time, perhaps, by agreeing upon some polite ‘values’, held mainly by emotion. Inevitably, however, it will fall apart, built as it is on shifting sand, expediency, a balancing of competing faux-rights, and the inherent disorder within Man called ‘original sin’, compounded by all of our personal sins, our self-seeking and compromises, will eventually lead to a moral torpor and breakdown, as we are witnessing. So take what victories we might, and rejoice therein, but until we stand once again upon solid rock, the pillar and bulwark of the truth, the teaching of Rome under the successor of Peter, the Vicar of Christ, such victories will remain rather transient and rather effervescent. 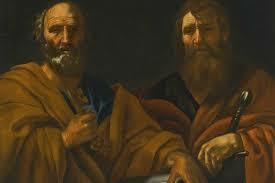 Saints Peter and Paul, orate pro nobis!